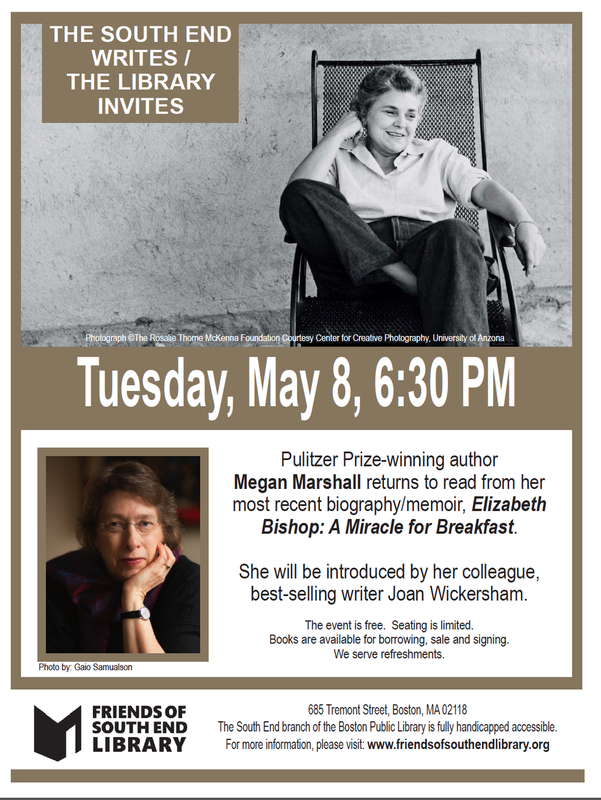 Megan Marshall's Acclaimed Biography/Memoir, "Elizabeth Bishop: A Miracle for Breakfast," Illuminates the Sestina, a Poetic Measure Used by Marshall in the Biography and by Bishop in her Poems. 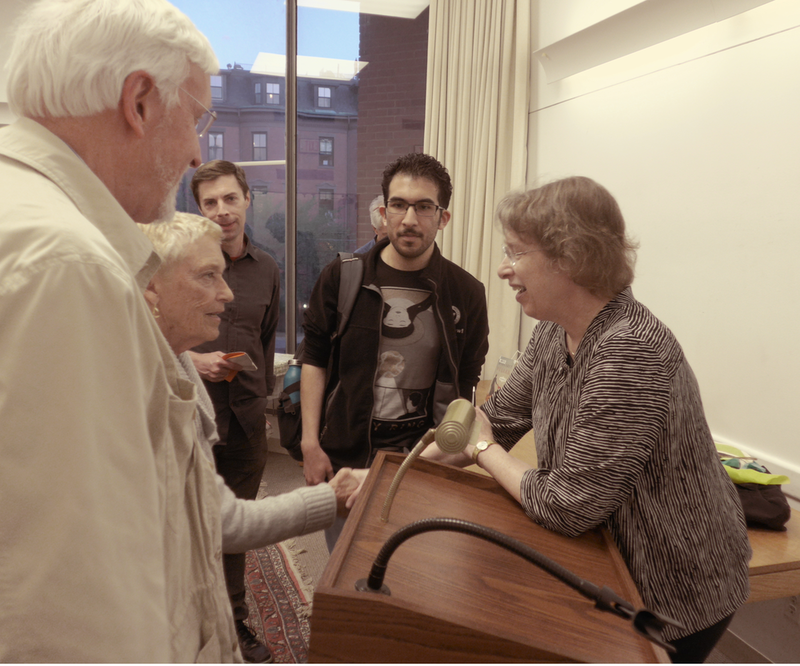 Acclaimed biographer Megan Marshall, who first visited the South End Writes in 2014 to read from her Pulitzer-prize-winning biography of Margaret Fuller, returned on May 8 to find a room full of Southenders eager to hear all about her most recent, and widely praised, biography, Elizabeth Bishop: A Miracle for Breakfast. She was introduced by her colleague, author Joan Wickersham, who described Marshall as a "peerless biographer who does meticulous scholarly research so that you, as a reader, get to know her subject deeply." Marshall, who also wrote The Peabody Sisters: Three Women Who Ignited American Romanticism, a finalist for the Pulitzer Prize in 2006 and winner of several other awards prestigious awards, had been accepted in 1976 in Elizabeth Bishop's last verse-writing class before the poet died, in 1979 at age 68. Bishop also had been a guest speaker in a Robert Lowell poetry workshop Marshall had attended in the early 1970s when she had hoped to become a poet herself. By that time, Bishop had been the Poet Laureate at the Library of Congress in 1949-1950, won the Pulitzer Prize for Poetry in 1956, the National Book Award in 1970, and the Neustadt International Prize for Literature in 1976. The personal connection provided Marshall with the opportunity to innovate the biography of Bishop by interspersing it with her own memoirs, in short sections, as she moves through the biography, said Wickersham. "It is a meditation on how we know another person," she commented. "The memoir part is about Marshall NOT knowing Bishop because, in life, you know people by their role, but not the real stuff. After reading this book, I really knew Bishop." Wickersham noted the structure of the Bishop biography echoes the sestina, a French poetry measure dating to the 12th century. It consists of six stanzas of six lines and a final triplet, and uses six particular words in a certain pattern. This is a form Bishop used in, among other poems, A Miracle for Breakfast, with the words Balcony, Crumb, Coffee, River, Miracle and Sun. Marshall took those very words to name the six chapters in the biography, using the sestina's poetic form, "to tell the story about the poet," as Wickersham put it. Bishop wrote both poetry and short stories, many of them published in The New Yorker,; since she produced only 100 poems, Marshall confessed she had thought hers would be "a short biography." But in 2011, archives no one knew existed suddenly became available after Bishop's last partner, Alice Methfessel, died. It Included letters of passionate love between Methfessel and Bishop, as well as four letters Bishop wrote to her psychoanalyst, Ruth Foster. “So the book became longer,” Marshall said. And darker. The archives threw a new light on Bishop's harrowing childhood: her father's early death; her mother's confinement and death in an insane asylum; the molestation by an uncle. Bishop was raised by a succession of relatives in Great Village, Nova Scotia, and Worcester and Revere, MA. She attended Saugus High School, then Walnut Hill School in Natick and Vassar College in New York. Her well-to-do Bishop grandparents (their contracting company built the Museum of Fine Arts and the Boston Public Library) provided her with a financial stipend and paid for the custodial care offered by her mother's sisters in Revere. Bishop was plagued by shyness, asthma, alcoholism, and a deep frustration that her poems took so long to produce. Marshall speculates the drinking bouts were perhaps a desire for oblivion over the pain caused by the tragic separation from her mother. A get-together her father's relative once had organized for her was so traumatic to even contemplate that Bishop fled. But in January 1977, Marshall and a few other students were invited by Bishop to a party at her home on Lewis Wharf in Boston. “Bishop was shy but had parties for friends," Marshal said. "The condo overlooked the harbor where, once "her great-grandfather may have landed." Bishop did not see her love for women as problematic, nor, Marshal said, did her analyst, Ruth Foster. She even lived as a married couple in Brazil for more than a decade with the architect, Lota de Macedo Soares. "Bishop found ways to live near, or with, her lovers. She lived as she chose," said Marshall, 'but even though gay liberation had begun in the 1970s, neither she nor her later partner, Alice, were ever really 'out.'" “There are always things I can identify with,” Marshall said of the subjects of her biographies. “Bishop’s unruly hair reminded me of an elementary school report I received where the teacher asked, 'Can’t Megan ever comb her hair?' And I did not know until I began to research the book that Bishop was interested in Early Music," she added, revealing she studied piano and harpsichord for many years herself.